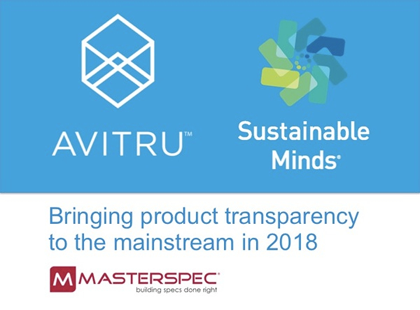 Avitru and Sustainable Minds are making it easier for architects and engineers to find, understand, select and specify products to construct higher-performing, greener & healthier buildings. Announced at Greenbuild 2017, and generally available during the first half of 2018, this partnership connects Avitru and Sustainable Minds so architects, engineers and contractors (AECs) can access the information they need – in one place. The SM Transparency Catalog™ is the educational marketing & customer service solution that makes it easy for architects, engineers, and designers to find all brands and all their products with transparency disclosures (environmental product declarations, and material ingredient disclosures) to inform greener & healthier specification decisions. The Catalog showcases all brands investing in product transparency and ONLY their products with transparency information. It also provides easy-to-understand information on how to use these documents to earn credits in green building rating systems including LEED v4, Collaborative for High Performance Schools, Green Globes, the Living Building Challenge and Well Building Standard. Ultimately, the cloud-based platforms of Avitru and Sustainable Minds will work together to provide, credible and complete product transparency information. Better building leads to better lives. We are extremely excited about making it easy for all building professionals reward these brands by selecting and specifying their products with transparency information. The result will have a tremendous impact on how decisions about building products are made. Find thousands of products with transparency information across most CSI MasterFormat® divisions. Making it easy to get the specs. Manufacturers’ listings in the Catalog will be co-branded and cross-linked to their free Product MasterSpecs online. Making it easy to specify products with transparency information. Access to the SM Transparency Catalog brands and products from within MasterSpec will be developed during 2018. Making it easy to learn more about the products. Product MasterSpec will be enhanced with new content to stipulate how products with transparency information get specified, with links to the Catalog listing.